The word “memory” has many meanings these days–13 definitions to be exact, according to dictionary.com. When I was a child, it meant one of two things: 1) the special place in my brain where I collected mental versions of good (and bad) life moments, and 2) that Milton Brothers card game that I would play for hours on end. As an adult, I still think of memory as being that thing that I carry around inside of my brain, with all sorts of images and sensations and experiences sloshing around from over the years, but another definition has taken on new and important meaning–that of the contents of my second brain, the one I carry around in my laptop case. 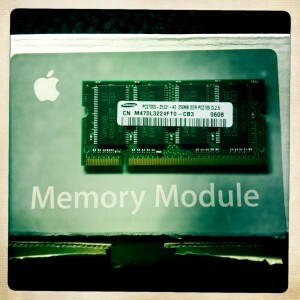 I was desperately searching for my camera charger this morning, and though I haven’t found it yet, I came across a little box labeled “memory module” in my search. 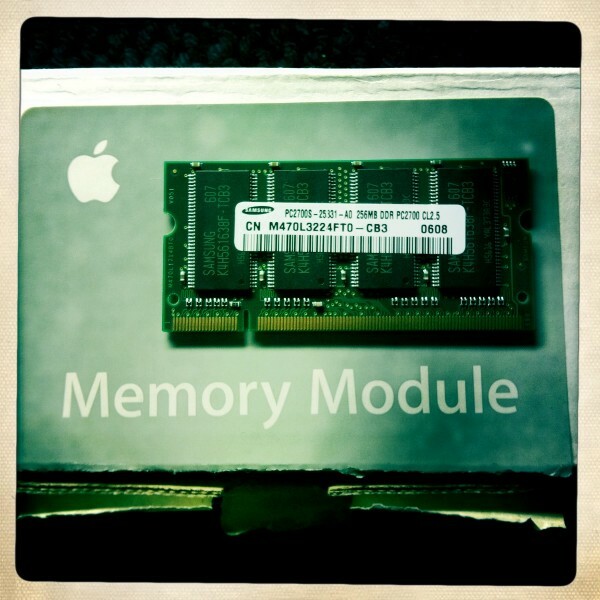 I remember taking this 256 megabyte (MB) module out of an old iBook and replacing it with a 512MB module to max out the memory. I also remember considering my first iPod purchase shortly thereafter, and quickly realizing that the memory of an iPod could exceed that of my laptop. At the time, I couldn’t wrap my head around how that was possible. A few weeks ago, I decided I needed to get a new external hard drive, as I’ve been using the same one for about five years now, it hums loudly, and it has very little space left. I found myself astonished yet again–five years ago, I couldn’t decide between something like 80 gigabytes (GB) and 130GB, and now I was choosing between 500GB and 1 terabyte (TB). I opted for the 500GB on my meager grad school budget (though I already have a feeling I’ll be replacing it sooner than I’d like). At first, trying to imagine filling a TB of space was like trying to imagine a million dollars sitting on a table: it wasn’t easy. But then I started to think about how many files we’re sharing all the time, and how complex those files are becoming, and with every day that passes, it makes even more sense that our memory–especially the one that exists in our computer–is going to continue to grow in capacity and function as long as we travel at a similar (or faster) rate of technological innovation. Maybe it’s just me, but thinking about the “memory” trajectory we’ve been on completely boggles my mind sometimes.